Buy Clearspring organic sea salad 30g in the UK from our online shop or directly from our independent Scottish store. Sea salad is a ready-to-eat blend of three sea vegetables; dulse, sea lettuce and nori. Clearspring Organic Sea Salad is sustainably wild harvested and dried in Brittany. Sprinkle the flakes straight from the pack onto salads, vegetables and soups. Dried sea vegetables: dulse (Palmaria palmata), sea lettuce (Uva lactuca), nori (Porphyra tenera). Seaweed is high in iodine. Anyone with thyroid problems should seek medical advice before using seaweeds. As official Clearspring stockist, we sell genuine Seaweeds directly from our shop in Scotland and online throughout the UK. Where can you buy real Sea Salad Organic safely online? If you are wondering where you can buy Clearspring organic sea salad 30g safely online in the UK, then shop with us. We are an actual health foods shop; with real people selling real foods and products. Our award-winning independent shop is located in Stirling, Scotland since 1976. You can buy our Organic food and other genuine Seaweeds in store or safely place an order with us online or over the phone. 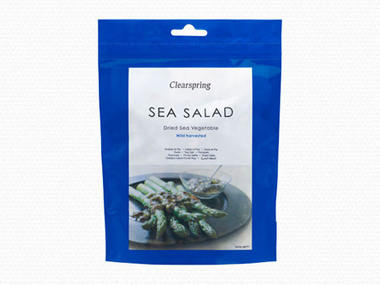 Sea Salad Organic - Clearspring organic sea salad 30g in Seaweeds and Foods.